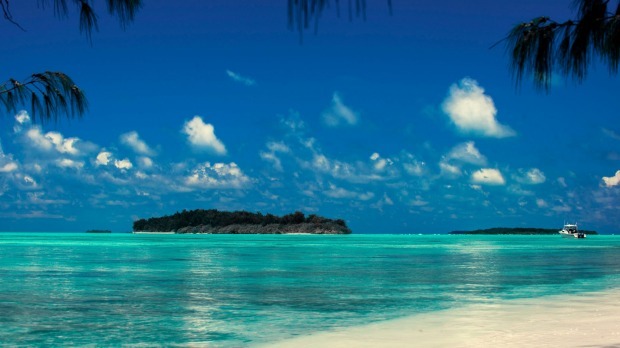 It's not every day that you get to visit an idyllic tropical island in the company of its charismatic owner. 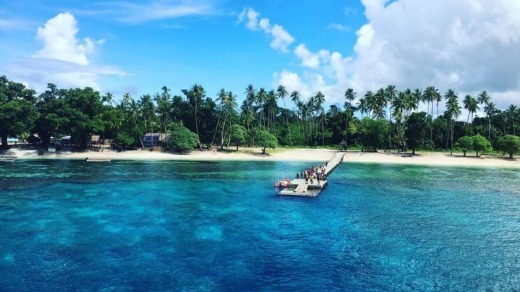 However, on a recent P&O cruise to Papua New Guinea, UK-based Australian businessman Ian Gowrie-Smith escorts a small group of travel writers around one of his Conflict Islands, an isolated eco-haven in the shimmering Coral Sea. The Conflicts group is a little-known ring of 21 coral islands surrounding an astoundingly beautiful lagoon that's home to one of the world's most richly diverse reef systems. In the 15 years since he bought the islands, sight unseen "because I could", Gowrie-Smith has established the Conflict Island Conservation Initiative (CICI) which operates Panasesa Island's turtle nursery, among other projects, oversees the development of organic vegetable, fruit and herb gardens that supply produce for the restaurant and built a few low-key, sustainable resort facilities that for the past two years have been open exclusively to P&O's guests. When I say "resort facilities" I mean a couple of tastefully designed open-air bars, the beachfront restaurant, a custom-built swim platform for guided snorkelling on the reef, carefully cleared pathways for walking around the island and a small shop selling carvings from other islands. You can take a glass-bottom boat tour to view the reef's riches if you don't fancy snorkelling (which by the way you can do on your own if you wade in from the beach rather than use the swim platform), join a two-hour scenic cruise aboard the 80-foot steel cruiser Undersea Explorer, and go kayaking and stand-up paddle-boarding. Our first activity at this picturesque island paradise is sailing to a nearby island on a traditional outrigger canoe. Captain Manoa tells us that these can reach speeds of up to 16 knots and changing direction requires skills that would impress any modern-day Olympic sailor. After snorkelling for as long as we possibly could in sublimely clear, warm waters, we take an informal version of the guided walk around the island with our genial host. Having made his fortune in industries such as mining, oil and pharmaceuticals, Gowrie-Smith now devotes much of his formidable energy to protecting the marine habitat of the Conflicts. 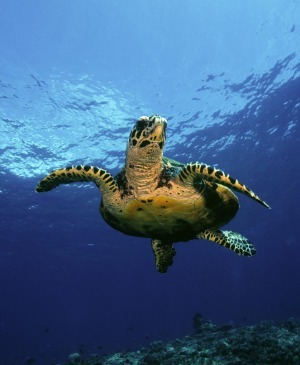 Although the islands were not inhabited by indigenous people, turtles were hunted for food and trade; Gowrie-Smith has put a firm stop to this and he and various interested parties are working together to find local communities more sustainable ways to make a living. A visit later in the afternoon to the hatchling nursery, where baby hawksbill and green turtles are hand-fed and nurtured until they are ready to return to the ocean, is one of many highlights of the day on Panasesa. Seeing a child release her hatchling into the turquoise waters is an emotional experience for everyone observing and it's a moment she will no doubt remember for the rest of her life. Over the course of our leisurely walk we learn that the islands were named after their European discovery in 1886 by HMS naval survey ship The Conflict and that in 1895, an Englishman called Henry Wickham took out a 25-year lease on the Conflict Islands with the aim of growing sponge, cultivating pearl oysters and harvesting coconuts for copra. Author Joe Jackson tells the story of this failed venture in his book The Thief at the End of the World; Wickham's long-suffering wife Violet kept a meticulous diary of their travels and travails. History is a recurring theme on this cruise, whether it is colonial, World War II-related or about centuries of tribal traditions. Pacific Eden's first stop after leaving Cairns is Alotau, the hot and steamy capital of Milne Bay province. P&O offers six local shore excursions here, including visits to homes in nearby villages and to Huhu in the cannibalistic hinterland, plus a free shuttle to and from Alotau Cultural Festival, about 15 minutes' drive from the port. Set up as an introduction to PNG cultures for tourists, the Cultural Festival is loosely based on the annual National Kenu and Kundu Festival. It comprises stage shows of tribal music and dance, stalls selling arts and crafts, and a contemporary arts centre where we catch a hauntingly beautiful performance by local singer-songwriter "Ice Man" Isaiah. And for 10 kina you can ride in a canoe paddled by warriors, an exhilarating (and hilarious) experience not best suited for super-sized Westerners. The two-hour narrated Milne Bay history cruise takes place on the Underwater Explorer, the same vessel we later see in the Conflicts where it's put to use for round-island scenic cruising. I have some misgivings about the boat's name – do we want to explore underwater? – but local historian Jeff is a mine of information. Learning about the Battle of Milne Bay while sailing in the waters where some of these WWII events occurred is a major eye-opener for me; for several P&O passengers it is a journey back into recent family history. Windy conditions prevent Pacific Eden from anchoring off the island of Kitava so we steam on towards Kiriwina, the largest of the four main Trobriand Islands. It has a population of about 12,000 and most villagers are subsistence farmers; although there are no organised shore tours you can pay a local guide to walk inland to see gardens and villages or visit the primary school. A short tender ride takes us to the jetty where we are greeted by friendly, colourfully dressed islanders, and we have the best part of a day to wander around market stalls, chat with the locals, laze on the beach and swim or snorkel in the warm, clear water. A word of advice here: while the marine life on the coral reef is (almost) as mesmerising as that off Panasesa Island, you need to keep an eye out for boys on canoes who ferry visitors out from the beach to the best snorkelling spots. I had a rude awakening from the dreamy underwater world when a canoe hit me on the head. Not seriously of course and the keen young paddler was as surprised to see me as I was to encounter him. 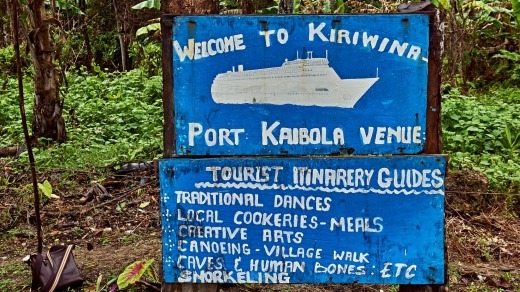 Make sure you take some kina if you're planning to buy a souvenir on Kiriwina. You'll find high-quality hand-carved wooden bowls and figures, tribal artefacts and exquisite hand-woven baskets – however, kina is in short supply and it's difficult for the islanders to change Aussie dollars. You could also splash out 10 kina for a look at some WWII skulls and bones in a cave just behind the beach, or five to pose with a tame cuscus at a market stall. Our visit to the Conflict Islands is the last port of call before we head back to Cairns. 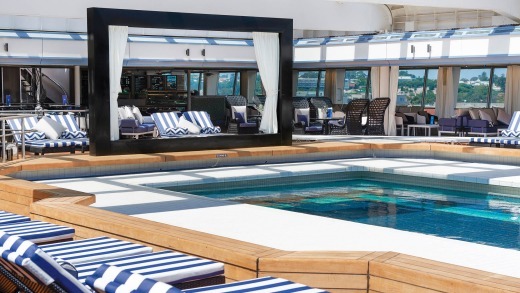 P&O's future PNG cruises will be longer and depart from Brisbane; the Conflicts are now on upcoming itineraries of P&O's sister lines Princess, Seabourn and Holland America Line. This short cruise feels like a taster, a tantalising glimpse into a nearby but very different world – one that would amply reward a longer stay. PNG occupies the eastern half of the island of New Guinea and its offshore islands in Melanesia. It is Australia's closest neighbour – the shortest distance between the two countries' borders is about 150 kilometres. The western side of the island, Papua and West Papua, is governed by Indonesia. 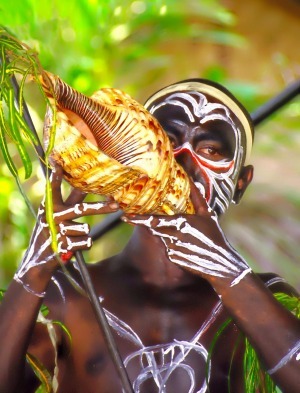 More than 850 distinct languages are spoken in PNG, making it the most linguistically diverse country in the world. There are three official languages: English, Hiri Motu and Tok Pisin. PNG became independent in 1975, after being governed by Australia since 1906. Prince Charles and then Australian prime minister Gough Whitlam attended the independence ceremony, during which Port Moresby was nominated as the official capital. Peter O'Neill has been prime minister of PNG since 2012. Hundreds of ethnic communities live across the country's 600 islands and regions that are geographically isolated by mountains and volcanoes. Tribal living is still a major part of the culture and less than 20 per cent of the population lives in urban areas. PNG is home to a huge variety of flora and fauna and has been described as an ecological extravaganza, with many species endemic to the region. It is renowned for its marine and birdlife – 38 out of 43 known species of the Bird of Paradise live there.